I’ve wanted to make this for such a long time, and I have finally gotten around to it. All in all, it’s fairly easy to make, with only a limited number of ingredients that are really inexpensive. Here’s the thing, though: the result was a little disappointing. The gnocchi nuggets were good, but not very intensely flavored. Making them again, I’d be tempted to throw the spice packets that came with the ramen into this recipe, but I guess that isn’t in the spirit of what these are. My version did not use the gemolata butter for finishing. Instead, I went with more butter in the finishing/browning stage, along with some chopped bacon and parsley. 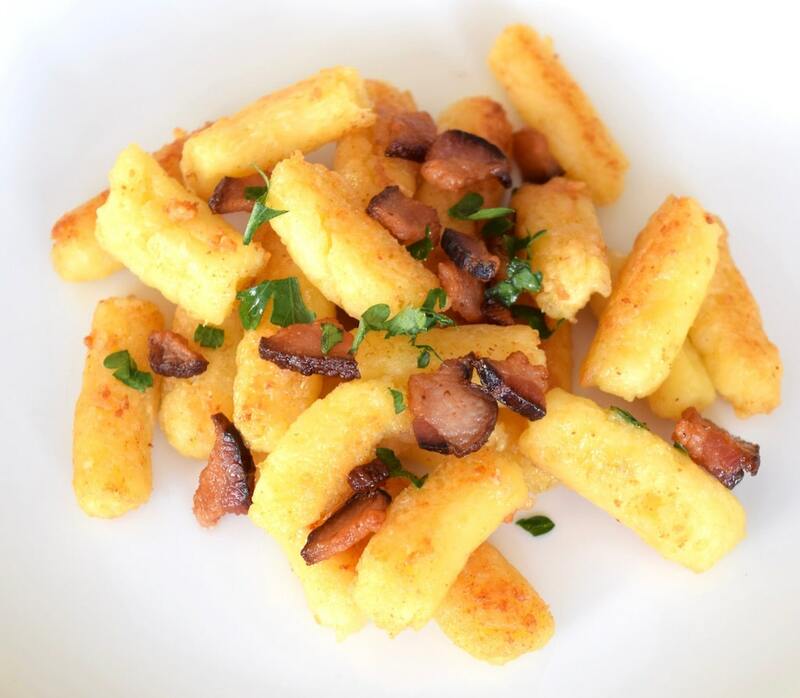 If you make these—and I recommend that you do—note that the finishing step of frying the boiled gnocchi in butter must be done over medium heat, at the highest. If you keep the heat low, it will take some time for the gnocchi to brown, but it will be a nice and even browning. Bring the milk to a boil in a small saucepan and remove from heat immediately upon boiling. Break up the ramen noodles and add them to the milk. Let them sit and soften in the milk for about 1 minute. They will still be mostly firm. Strain the noodles, reserving the milk. Then combine the noodles and a cup of the reserved milk in a blender and purée for 30 seconds or so. I used an immersion blender for this step. Add the egg yolks and continue blending until the mixture is the consistency of loose toothpaste. Transfer the batter to a pastry bag (or two) fitted with a half-inch wide tip and refrigerate for about the time it takes to bring a big pot of water to a rolling boil. Lightly grease a rimmed baking sheet, which is where the gnocchi will temporarily reside after boiling. It’s best to do this next step in batches. 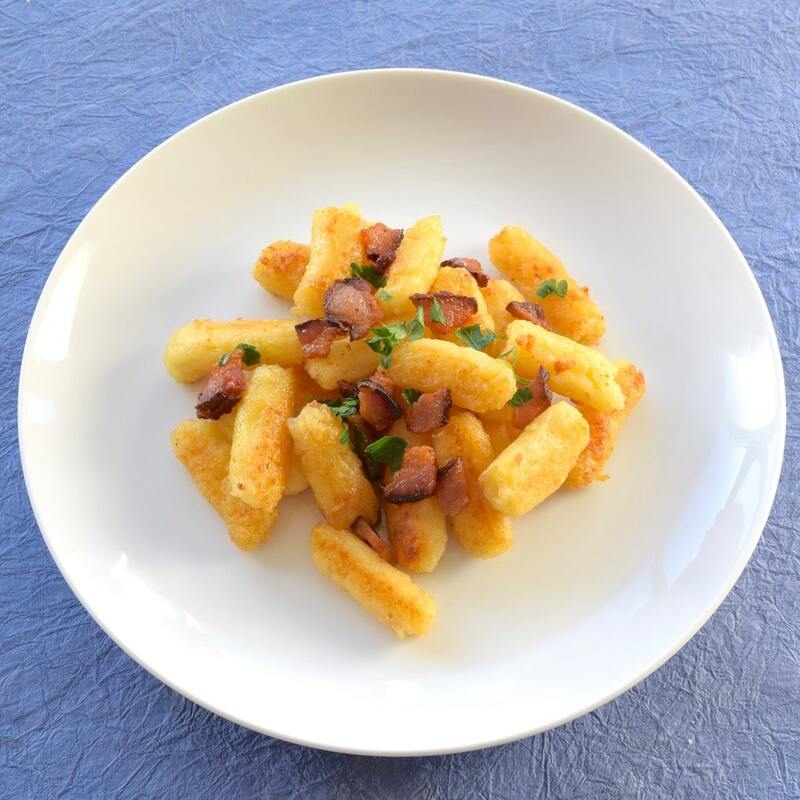 To cook the gnocchi, pipe the dough out directly into the boiling water, using a butter knife to cut one-inch logs as dough comes out of the bag. Cooking will take about a minute, and you’ll know the gnocchi’s done when it floats to the surface. Scoop the cooked gnocchi out of the water with a slotted spoon and gently put them on the greased baking pan. At this point, they can be refrigerated for later use within a day or two. To finish, heat up a tablespoon or two of butter in a sauté pan over low-medium heat and gently brown the gnocchi in batches. This can take between 4 and 10 minutes, depending on the stove heat. Add butter between browning the batches. No one said this was going to be a healthy dish! Finish with a squirt of lemon juice, gremolata butter, crumbled bacon or grated parmesan cheese, or any combination of the four. Never, ever heard of gnocchi made from ramen noodles! But it sounds good. I hear you. It’s a David Chang thing. He does all sorts of weird (and good) things with food.